PA Excellence is a Sydney based professional virtual assistant solution for your business. We can help you with your legal secretarial, document management, event management and transcription needs. Our legal virtual assistants and executive assistants are here to support you and your business. PA Excellence can assist you with all of your business administration, transcription, event management and secretarial requirements by providing a virtual assistant solution that can save you time and money! Do you ever feel overwhelmed with the amount of work you need to get through? Wouldn't you like to be doing what you do best in your business and not the admin tasks that take up so much time? What do you do when your secretary is sick or on holidays? Do you have a project that you need help with and you need that extra support? Does spending time on your day-to-day administrative tasks drive you crazy? Is it time to spend more time focusing on the growth of your business and less time on your long to-do list? 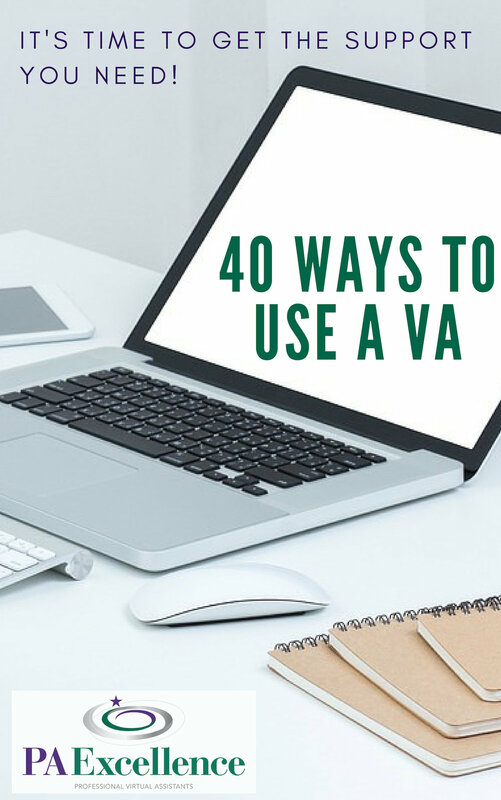 If you aren't sure what a Virtual Assistant can do for you then download our free guide "40 Ways To Use A Virtual Assistant" by clicking on the button below. Our Services pages list our most popular services. If you answered yes to any of these questions then a virtual assistant can help you! How can PA Excellence save you money? What are the advantages of hiring PA Excellence? You will only pay for the productive hours that we work. We are highly dedicated, professional virtual assistants who take pride in their work. Therefore, you can have confidence in the quality of work produced for your business. As an Australian based company all work is completed in Australia by Australian virtual assistants who understand Australian businesses. You have complete flexibility in your business and only use our services when your business needs support. Our business will work in partnership with your business, supporting you to ensure the growth of your business. PA Excellence would love to hear from you! Let us assist you with your business. To send us an email simply fill out the form below. We will be in touch with you as soon as possible to help answer your query.